De-stress. Transform. Unleash the power within by applying meditation techniques used for centuries by the masters. Join our resident expert, Jim Owen, as he explores this year’s theme improving your life through meditation. In each of ten consecutive sessions, participants focus on a specified topic: feeling your love, reducing stress, feeling your own power, letting go, allowing, accepting yourself, accepting knowledge, preparing for the day, transcending, and accepting blessings. Enrich your spirit in the beauty of the LongHouse gardens. LongHouse Reserve exemplifies living with art in all forms. Founded by Jack Lenor Larsen, its collections, gardens, sculpture and programs reflect world cultures and inspire a creative life. 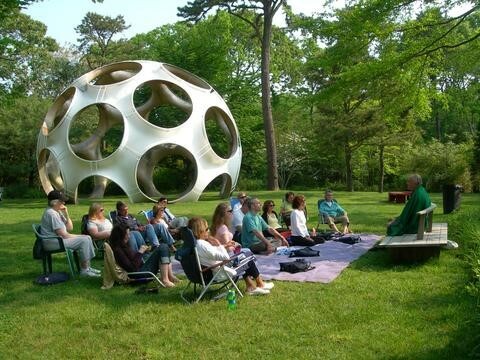 LongHouse Reserve is a 16-acre reserve and sculpture garden located in East Hampton, NY, featuring pieces from Buckminster Fuller, Yoko Ono and Willem de Kooning to name a few.